Lila turned three this past week. 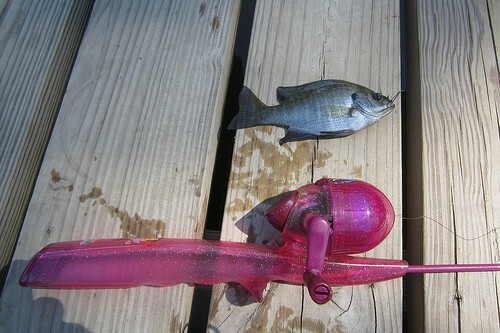 Life is so busy, I hadn't had time to take her fishing yet this spring. It is hard to find a time when I can take just her. 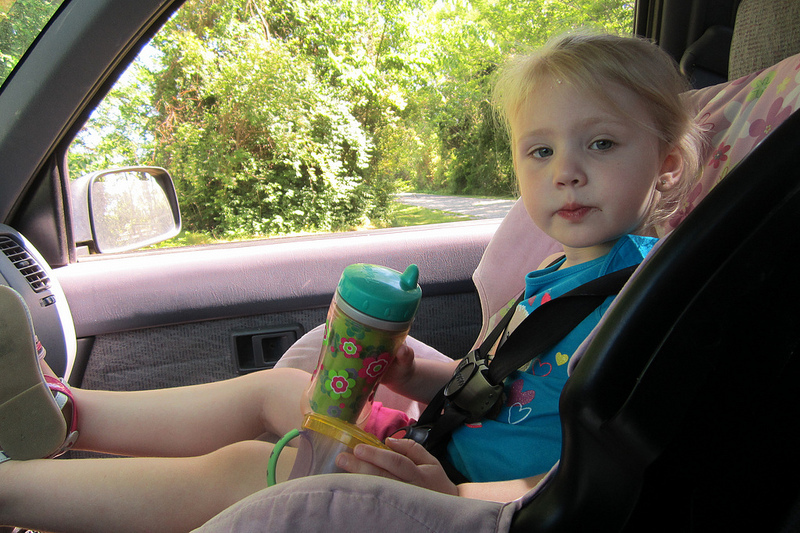 My other daughter, Melody, is only 18 months. There is no way I can handle taking them both out with a rod and reel. Just the thought stresses me out! My wife graciously volunteered to watch the youngest while I took the oldest to one of the local lakes. 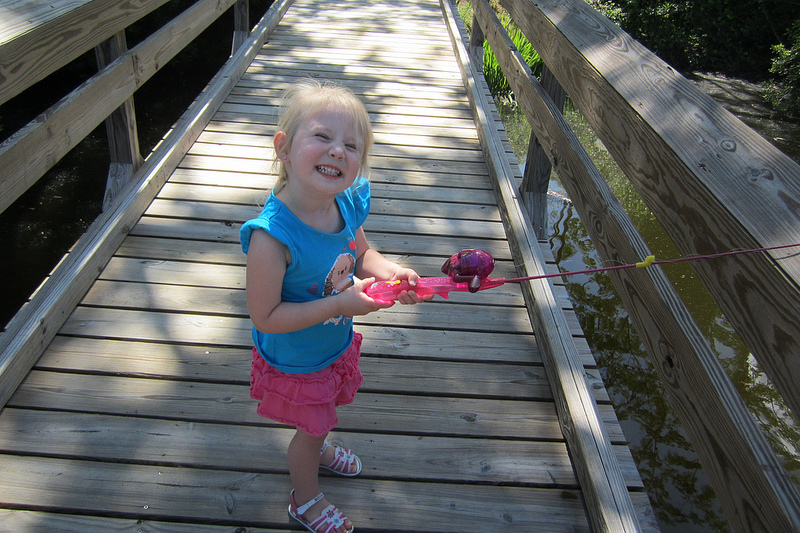 The "simple" act of taking a three year old fishing is far from simple. Lila is well potty trained, but when she has to go, she has to go! I had to bring her to an area with at least a porta-potty. Also, from past experience I have learned that she needs 100% of my attention. I didn't even bring one of my rods. My gear consisted of a Dora the Explorer fishing rod, a small box of hooks and weights, and some night crawlers. 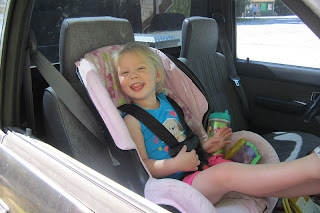 For Lila, the most exciting part of going fishing is driving in daddies truck. Of course she pronounces it as "daddies fwuk"! Sound it out in your head. We are working on that. Instead of fishing from the bank, I took her to a small peer over a freshwater lake. I never fail to catch fish from this peer. She thought it was awesome. A bridge! It was like we were walking on water! The first near disaster of the day was when I pulled out a big night crawler. She freaked out. 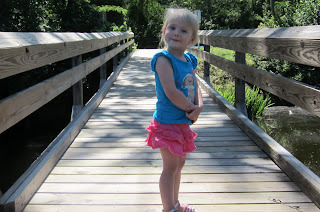 There is no question I am raising a girly girl. Lila did not want to come close to the worm or touch the fishing pole after I hooked a worm onto it. A totally fake smile purchased with a skittle. The only way I could get her to hold the pole and smile for a picture was to bribe her with a skittle. After that she had no interest. 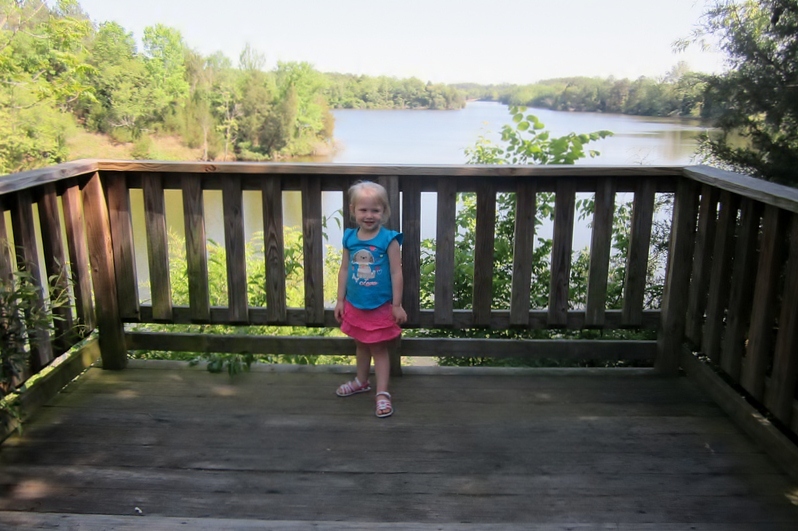 So, daddy caught a few bluegill with a Dora pole while Lila ran to the edge of the peer, grabbed handfuls of gravel, ran back and threw them into the lake. 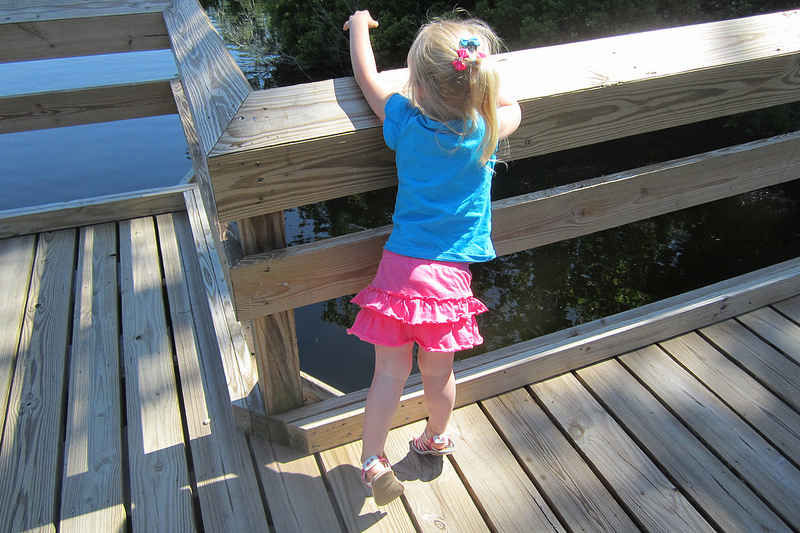 I don't understand what little kids like about throwing rocks into water, but she could have done it all day. 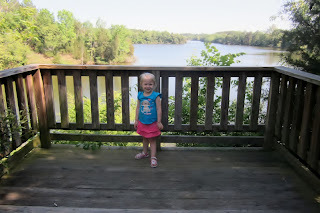 I quickly gave up on fishing and talked Lila into going "exploring" with me, just like Dora! We walked a few trails and found a few "treasures". This ended up the the most fun for her. I might not have a fisherman, but I do have a hiker! At one point I was carrying her on my shoulders and we were slowly walking along the bank, looking into the water for fish. I pointed something out to Lila and was quietly told to "stop talking". She then began to whisper in my ear "be quiet daddy" and "shhhh". When we got back to the truck I asked her why we were being quiet. 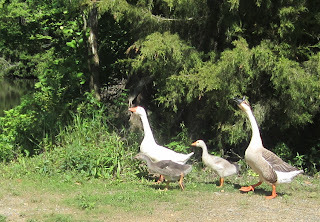 She mater-of-factly replied "I didn't want to scare away the fish." If she can be quiet and sneaky, maybe hunting will be more of her thing! Thirsty and hungry after out hike, but not tired! Any quality time with Lila is time well spent. So what, fishing didn't go well. All that matters is that I was with her, and bonus, we were outside!